550 pages | 300 Color Illus. Written by senior compositor, technical director and master trainer Steve Wright, this book condenses years of production experience into an easy-to-read and highly-informative guide suitable for both working and aspiring visual effects artists. This expanded and updated edition of Digital Compositing for Film and Video addresses the problems and difficult choices that professional compositors face on a daily basis with an elegant blend of theory, practical production techniques and workflows. It is written to be software-agnostic, so it is applicable to any brand of software. This edition features many step-by-step workflows, powerful new keying techniques and updates on the latest tech in the visual effects industry. A companion website offers images from the examples discussed in the book allowing readers to experiment with the material first-hand. "This book covers both the basic fundamentals and the advanced techniques of compositing, but Steve also presents the reader with a deeper background on the task at hand. You're not just getting a how-to manual, but an understanding of why you do it." 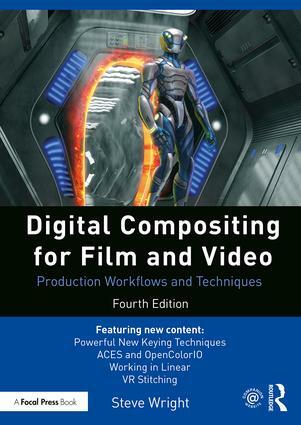 "Digital Compositing for Film and Video is the must have book for all compositors at all levels. I always keep copies close on hand for my artists to use and still refer to it often myself. The book covers the skills all compositors must know and the techniques needed when you are fighting tricky shots." "What’s astounding about this book is that, for the last 16 years, every edition has been ahead of its time in terms of teaching and explaining the different techniques, technologies, and tools used on a daily basis by compositors around the world. Steve Wright has managed, once again, to stay ahead of the game and spearhead the education of current and future compositors." 5.3.4 What About Blue Spill? 9.2.2 Why Do We Need Gamma? 12.2.1 What Exactly is Linear? 12.5.3 What About Video Productions? 15.4.1 What Are Log Images? 15.5.3 When, and How Much? Steve Wright is a visual effects pioneer and a 20-year veteran of visual effects compositing on over 70 feature films and many broadcast television commercials. With extensive production experience and a knack for the math and science of visual effects he is a world-recognized expert on visual effects compositing. Since 2005 he has been a master trainer in compositing visual effects, providing staff training to over 25 visual effects studios around the world including Pixar Animation Studios, Disney Feature Animation, Troublemaker Studios, New Deal Studios, and Reliance MediaWorks, along with many others. He has also trained over 1,000 artists in compositing.